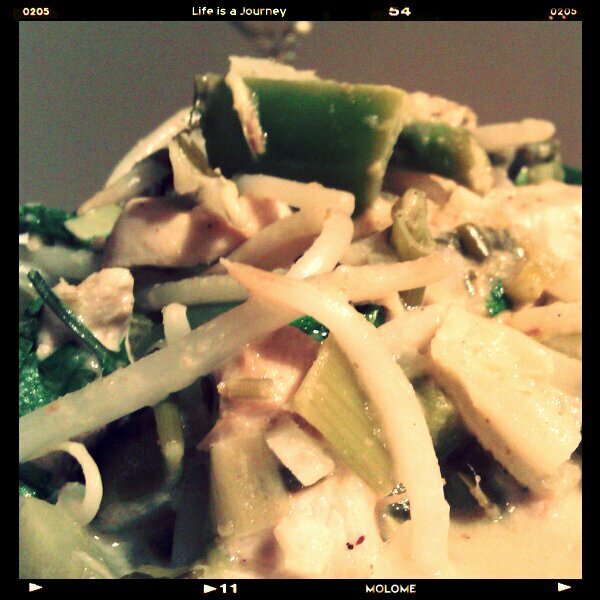 Thai Curry- chicken, green curry paste, green peppers, bean sprouts, onions, spring onions, spinach lime juice and coconut milk. Oh... and the more experienced hand of T.
Oh i'm a big fan of a Thai curry [we have lots of Thai restaurants around us] but my does that look impressive! That sounds (and looks) amazing - I wish I could eat it right off the screen, yum! I'm envious of your plentiful Thai restaurants, it's definitely a DIY job here, luckily T is a bit of a whiz with curry! I love Thai food in general, T has friends from Thailand and being invited to dinner at theirs is just the best thing EVER! It was pretty tasty, I'll be honest, and nice as something different as it's not the kind of food my Dad usually cooks. Oh yum, I would gobble this down! It looks amazing! Enjoy your Thai cooked elsewhere, but seriously, this curry is super easy to make, drop me an e-mail if you want the recipe- it really is a shove everything in the pan job! It was epic, exactly what I needed! It was really yummy, can't go wrong with fresh ingredients. Is It Coz I Is... small? © Chloe Likes To Talk. All rights reserved.